Start the trail at 1 on the map above. 1. In the 1830s it was said that Bridge of Allan consisted of old-fashioned mill and kiln, a wayside inn, a smithy and a few hovel-looking huts around a narrow humped-backed bridge. Due to success of the Spa, by 1868 there were over 100 lodging houses. 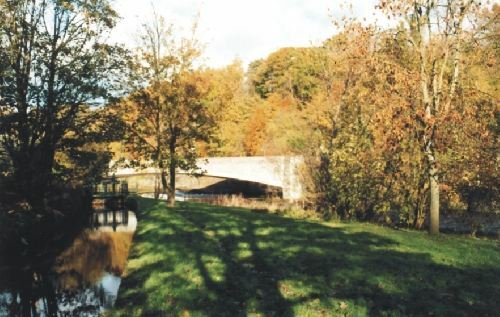 The weir and mill lade can still be seen under the present day bridge. Walk up the steps from the bridge along the path above the present road. This path was the original road through Bridge of Allan, running away from the swamp that once existed on the route of today's road. 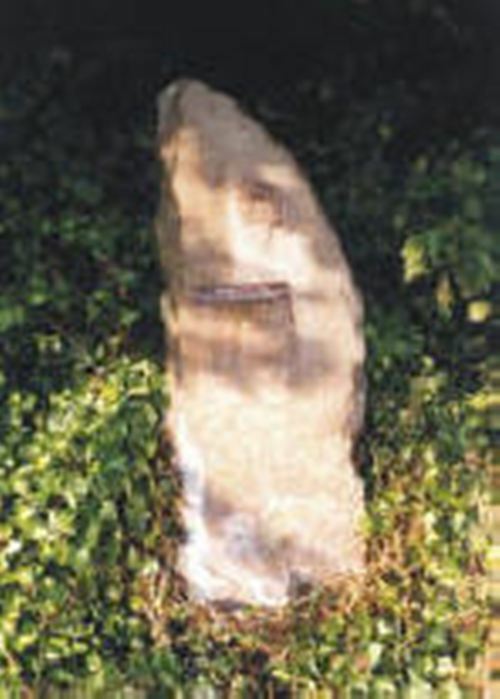 On this path you will find a Tollbar stone. Once used to control access to the bridge, it was situated at the south end of the bridge. Tollbars were abolished in 1883. 3. 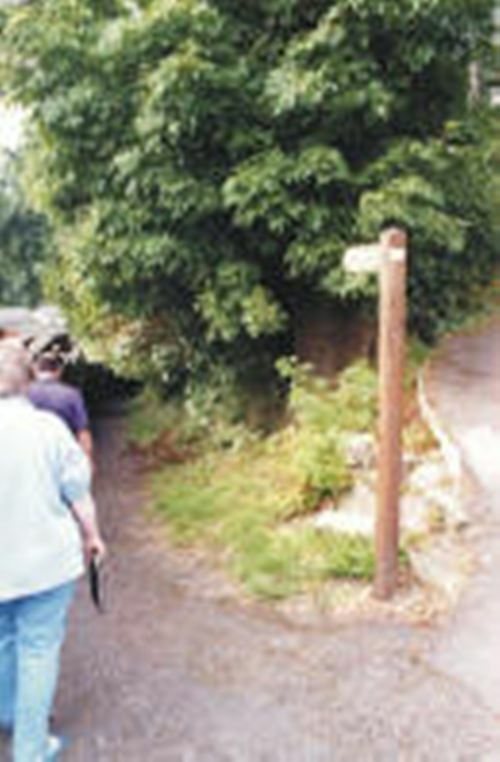 If you continue along this path, the original road through Bridge of Allan, and look to the left side approximately 10m before the path joins Well Road you will find a coffin rest (a large flat stone surface), where parties rested the coffin to take a break prior to burying it in the Kirkyard. was built in 1829. Some 1,000 gallons of excellent mineral water flowed into the Spa's Well House each day. The taking of mineral waters was said to cure rheumatism, gout and biliousness while bathing was good for skin complaints. At the Spa's peak of popularity it was said that 500 people a day would drink the waters. 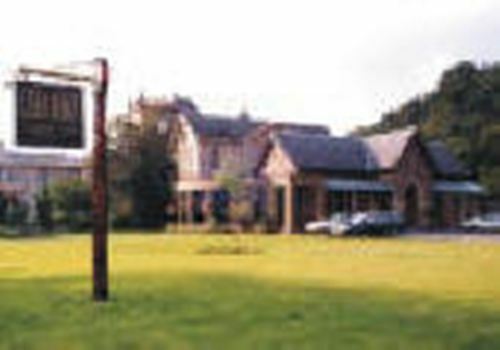 Bridge of Allan's Spa Pump Room and Well House can be visited today, where you can have a drink or meal in the special atmosphere of the old Spa building at Vecchia Bologna (See Eating Out). is now permanently located at the Cross, the hub of Victorian Bridge of Allan. 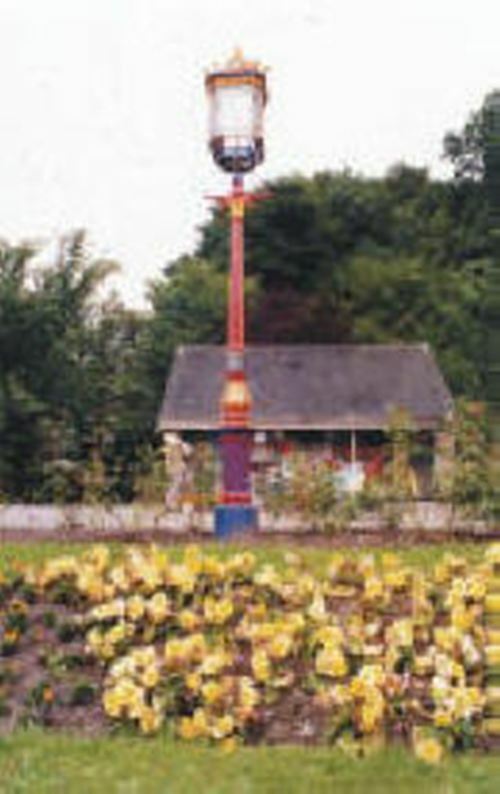 The lamp would in days past have been erected outside the house of Bridge of Allan's Provost. 6. ADAMO in Henderson Street. In 1854 some 30,000 visitors a year were accommodated in Bridge of Allan. Robert Louis Stevenson and his mother were frequent visitors to Bridge of Allan to take in 'the waters', both suffering bouts of illness, a weakness of the chest. The two year old Robert Louis Stevenson first came to Bridge of Allan in 1853 & stayed for 5 weeks. He was a frequent visitor often staying at the Queen's Hotel while finding lodgings to rent in the town. He was later to write: "I shall never forget some of the days at Bridge of Allan. They were one golden dream". Robert Louis Stevenson had to frequently visit the local doctor, Alexander Paterson who was also a distinguished botanist and horticulturist with an international reputation growing tropical plants, tree ferns and orchids in his garden. He may well have planted the seeds for 'Treasure Island' in Robert Louis Stevenson's young imagination. 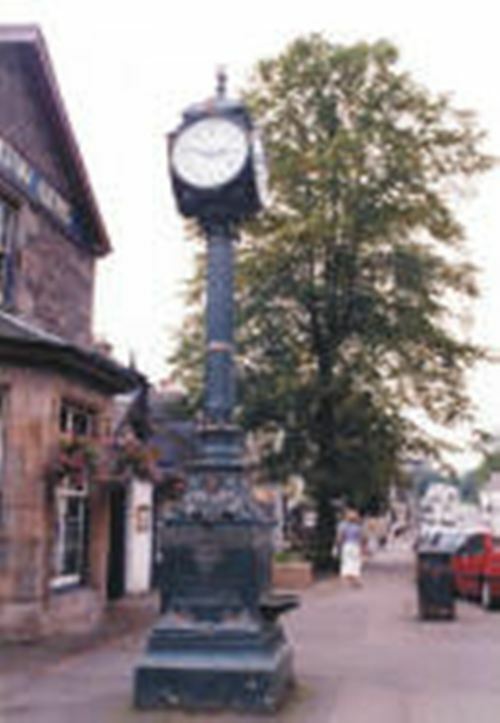 He became the 'father-figure to the entire neighbourhood' with the Paterson Clock standing as a memorial to him in the town. The famous Scottish Architect in 1904 designed the splendid chancel suite of furniture in the Holy Trinity Church in Bridge of Allan. 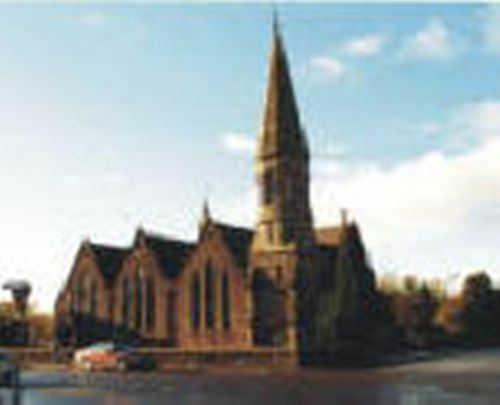 The church is open to visitors from June to Sept on Saturdays 10.00 am to 4.00pm. 01786 834155 for information. 9. The Fountain of Nineveh was erected in the 1850's by Major John Henderson who drew up the plans for the layout of Bridge of Allan as we see it today. The fountain was erected in honour of Sir Austin Layard who at the time had made important discoveries in Nineveh in Mesopotamia. inspiration for Robert Louis Stevenson's Treasure Island. Today it is known as the 'Darn Walk'. Outdoor footwear is recommended particularly if it has been wet; allow 60 to 120 minutes. You willfind the path off Blairforkie Drive signed 'Allan Walk' - follow this route. 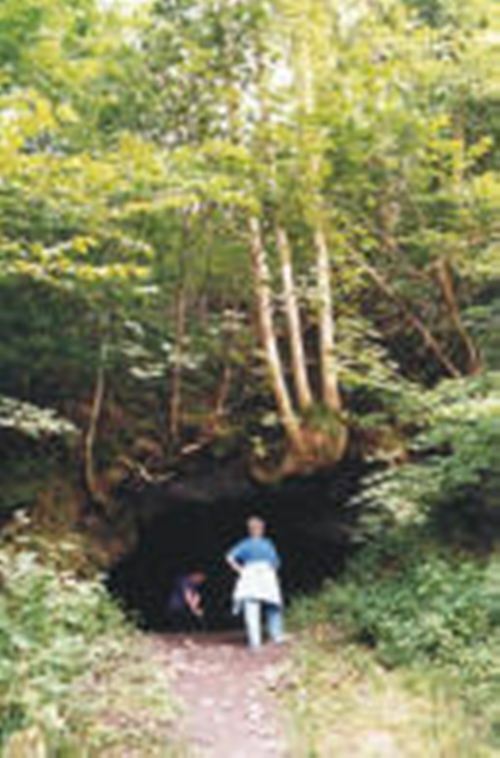 It is probable that the young Robert Louis Stevenson first visited the cave beside the Allan Water in 1859 when he was nine years old. The cave is an old adit or horizontal tunnel for the copper mine. He was to write "I went for my favourite walk by the riverside among the pines and ash trees. There is a little cavern here,….which has been a part of me anytime these last 12 years or more." It is probably this cave that he transformed in 'Treasure Island' to become Ben Gunn's cave.